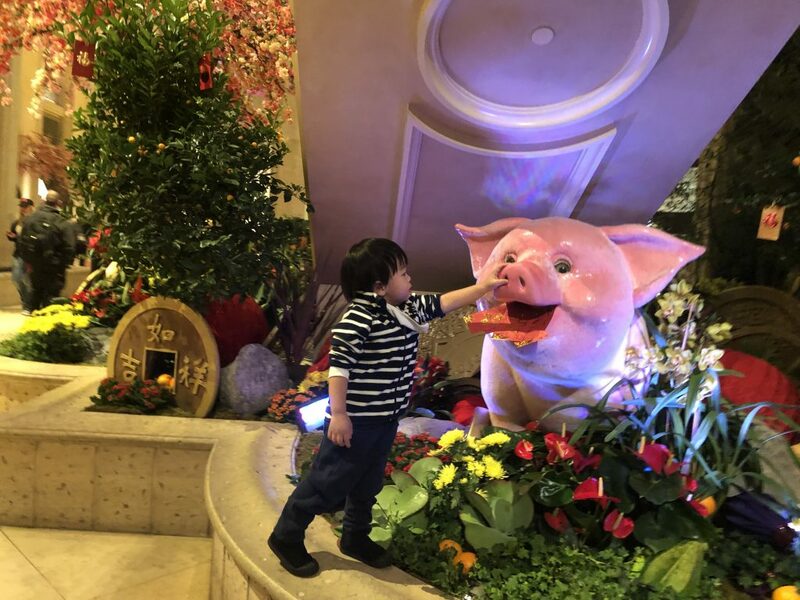 Julien Chen, a 2-year-and-a-half boy from Los Angeles, put his hand on the nose of a golden pig sculpture at the Venetian to feel the sense of the coming of the Chinese New Year, the Year of the Pig, as one of tens of thousands of visitors to Las Vegas from all over the world, Chinese or non-Chinese alike. For Chinese visitors, they want to see how the Chinese New Year will be celebrated in the United States, while for non-Chinese, they want to be part of celebrations for a culture that has contributed to the American “big melting pot”. Las Vegas has demonstrated its love for the Chinese culture with the celebration of the Chinese New Year. The golden pig sculpture Julien Chen has touched is one of the sculptures installed at the Venetian and the Palazzo, where a fengshui master has been hired to transform the waterfall atrium with an installation of a golden pig sculpture of 3,000 pounds that stands 16 feet tall surrounded by tangerine trees, chrysanthemums, orchids, succulents and bromeliads. Nine smaller pigs are placed throughout the waterfall atrium and the resorts’ lobbies. Four huge letters formed LOVE before the waterfall and a dragon sculpture is placed before the waterfall. Also, a tiger sculpture is placed nearby. Las Vegas commemorates the Chinese New Year with an array of culinary offerings and entertainment for visitors throughout January and February. The Las Vegas Convention and Visitors Authority says the destination will extend good fortune and prosperity to all who revel in the destination’s cultural festivities to celebrate the Chinese New Year, also called the Spring Festival. The LVCVA continues to promote Las Vegas as the premier tourism destination and has increased efforts directed toward the Chinese travel industry to promote the Entertainment and Meetings Capital of the World, according to LVCVA. Visitation from China has steadily increased over the past several years including a nearly 12 percent jump in 2017, making China the top Asian market for Las Vegas visitation. China recorded the most visitors in history with more than 260,000 guests traveling to Las Vegas in 2017, according to LACVA. December 2, 2018 marked the second anniversary of Hainan Airlines’ nonstop flight from Beijing to McCarran International Airport in Las Vegas. This route connects mainland China to Las Vegas and introduces the destination to millions of prospective visitors. The service provides additional convenience and accessibility for Chinese guests for the holiday and throughout the year. 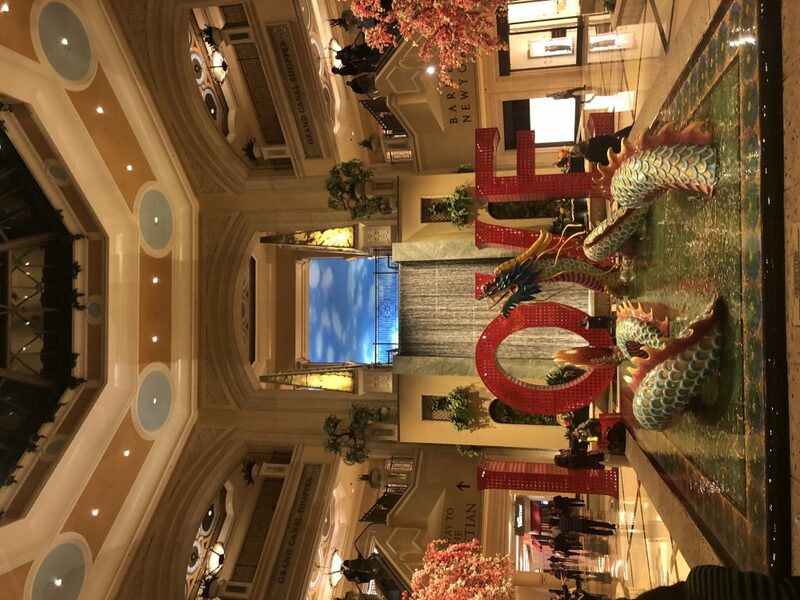 Visitors can see the annual celebratory dragon display at The Forum Shops inside Caesars Palace. The 22-foot-long dragon is not only a photo opportunity for visitors, but is also a traditional symbol of power, strength and good luck. Following a ceremonial ribbon cutting, the world’s tallest observation wheel, The High Roller at The LINQ, will be illuminated in red and gold to mark the beginning of Chinese New Year, Wednesday, February 6, according to LACVA. The main lobby of ARIA Resort and Casino will be adorned in celebratory décor to honor the beginning of the Lunar New Year starting Friday, January 25, according to LACVA. Three Chinese Deities personifying happiness, wealth and longevity: Fuk, Luk and Sau, will greet guests upon check-in at ARIA’s front desk. 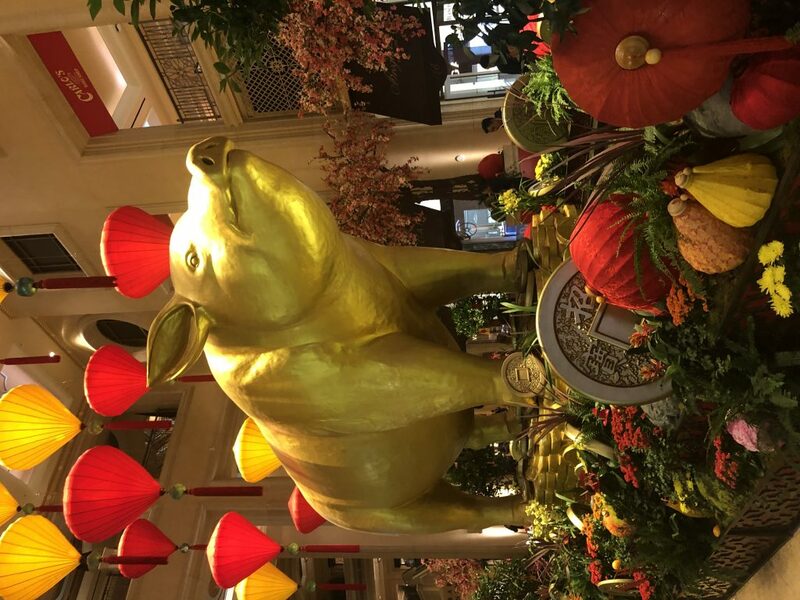 A 196-foot dragon will hang from the lobby’s ceiling, weaving its way around a money tree made up of 88 golden coins symbolizing wealth and good fortune with pigs surrounding the base of the tree. Fashion Show will host the 8th Annual CNY in the Desert Opening Ceremony and ring in the Year of the Pig with a special ribbon cutting and dinner Friday, February 8. To commemorate Chinese New Year, guests will be treated to a special ticketed VIP event, including lion blessings, traditional dances and a cultural fashion runway show. Following the ceremony, guests also have the option to experience a Lunar New Year family-style dinner and cocktails sponsored by Remy Martin, according to LACVA.